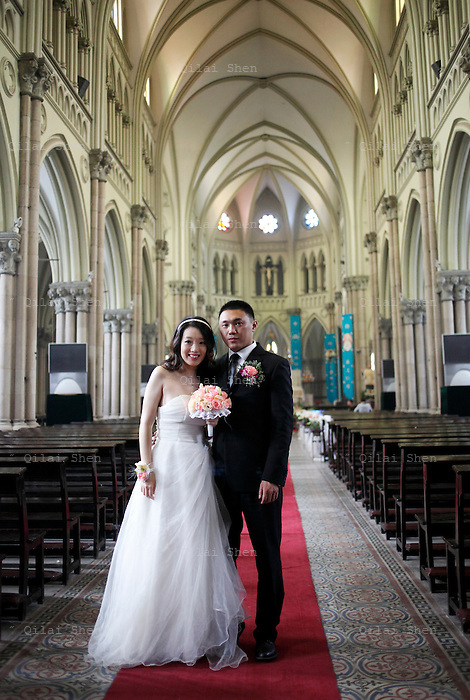 Coca and Juan Juan makes final preparations before their wedding ceremony at the Xujiahui Catholic Church in Shanghai, China on 23 May 2009. A hip street artist and a recent Catholic convert, Mr. Dai is one of many young Chinese embracing religion, perhaps to fill the lack of belief and ideology in an authoritarian communist China that embraces the most extreme form of capitalism in practice. The Chinese government and the Vatican have a long history of simmering mutual distrust and suspicion, as two parties compete for the control of the Chinese Catholic church, with some 15 million and growing number of faithfuls. Overall Christians now number over 110 million in China, which makes it the third largest Christian nation in the world.